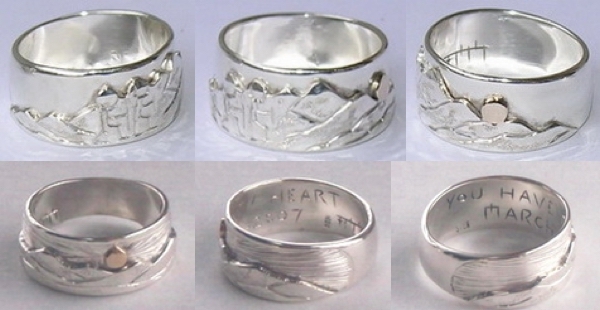 Appliqued Mountain Rings – Unique golds, silver or platinum combinations create the original themed mountain rings. Bearclaw Custom Native Indian Jewelry creates 2-tone works of Art. Golds, such as yellow, rose, white and green as well as platinum and silver can be applied to a ring base with sun ,stars and gems . The gold content is not important when doing Applique work so any gold from 10k, 14k and 18k will work fine with silver or platinum. There are technical concerns but they are my problem. Your problem is limited to letting me know the style and design of your ring and I’ll take care of the rest. Some people question the stability of the appliqué process. If done correctly with the proper temperature, acid bath and detailing the appliquéd pieces mold together as one metal. If there is a weak point it is the solder. 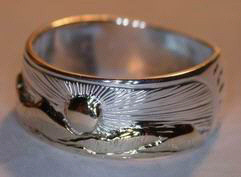 Silver solder melts at a lower temperature than 925 silver, ( 92.5% silver ) and gold so it will flow first and bond with the other metals before the ‘ melt ‘. 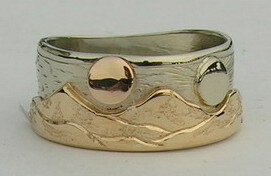 The surface of the base gold becomes slightly molten and the solder flows into it and bonds as one metal. A problem might occur if there is not enough solder, not enough temperature to melt the solder completely, or not enough to get the top of the base layer hot enough. After 31 years I have a good idea as to what temperature is needed and the process required. 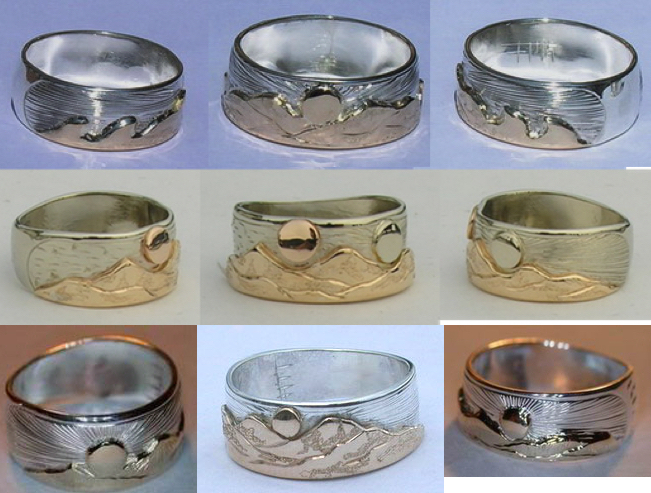 MnRAp23 – From Mountains to the Sea…..
You can see how using different contrasting metals the mountain ‘ pop-out ‘ and offer a distinct difference in the couture or item it is representing.